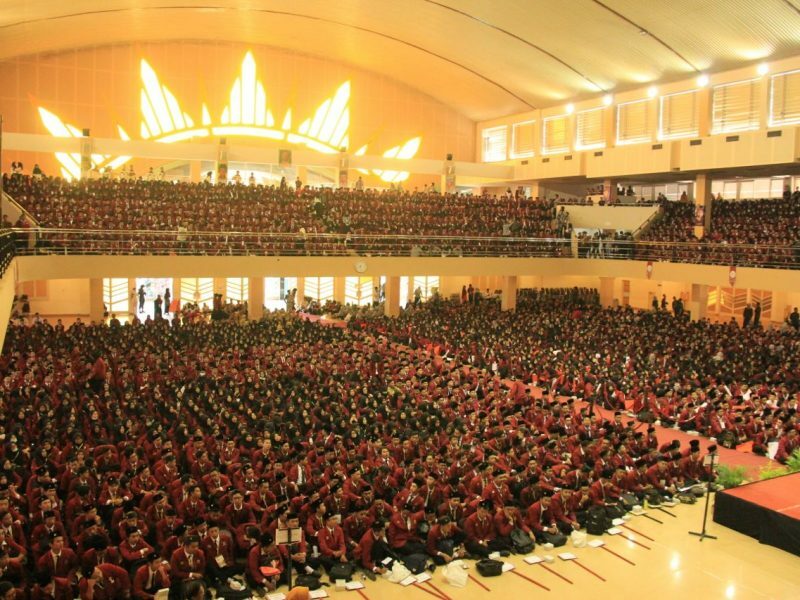 At the opening of Masa Ta’aruf (MATAF) of orientation day of freshmen on Monday (27/8) in Sportorium of Universitas Mihammaidyah Yogyakarta (UMY), Chairman of Muhammadiyah Haedar Nashir declared that new students should become an honest honest, faithful and knowledgeable individual to bear advanced generations who are free from corruption and upholds Islamic principles. Honesty should be entailed within themselves as students should avert cheating to make Indonesia better because nowadays we rarely find leaders prioritizing trustworthiness. “Cheating is small corruption so that they may corrupt when being officials in this nation. Being truthful is much better. You can success without cheating. If you can be honest to yourself, Insya Allah you will do the same to others,” stated Haedar in front of 5,374 students of batch 2018. Besides, another personality which students should have is being closed to Allah. Freshmen should have faith after the candor. However, Haedar remained them that having faith is not only hamlum minallah (the relationship between Allah and ourselves) but also being devout in social life. The significance of the honesty and faith in Allah starts fading away in Indonesia. Thus, Haedar expected that UMY students should dare to tell truth. When someone makes a mistake, it should be said so. They may not cover up the mistake with other mistake. They may not tell a lie. “Prophet Muhammad is our role model since he could unite Arabic people by being honest so that he was called Al-Amin,” said Haedar. He also mentioned that students should have quality knowledge. To create knowledgeable individuals is through reading. The first commandment from Allah is Iqra’ (read). Reading enables people to attain advancement and civilization. Meanwhile, Rector of UMY Ir. Gunawan Budiyanto, M.P. advised that students have to become pillars being able to preserve sovereignty of the Republic of Indonesia. “Students should maintain security of Indonesia from foreign threats and keep sovereignty of Indonesia which has begun being sold,” he emphasized. In the second session of the orientation day, an alumnus of UMY, a writer as well as a social activist Fahd Pahdepie stated that the freshmen should be agents of change. “As students, you should be valuable for this nation. Nevertheless, not all of students will be successful people. This is a fact that you have to receive and understand,” said Fahd, an alumnus of Department of International Relations of UMY. Fahd mentioned several means of being successful. “First, you should bear in mind that you have dreams and seek to achieve them. Success is not about GPA and achievements you gain, but it is bravery to attain your dreams,” he conveyed. “Second, you are in ‘debt’ to many people. To reach this point, you have been assisted by your parents and people around you. Based on research, 18 percent of Indonesian students possess an occasion to pursue higher education so that you have to pay off your ‘debt’ to the other 82 percent of the students,” stressed Fahd. “Last, you have to be aware that your life is waiting. Most of us may think that we are waiting for something, waiting for being a student, waiting for an opportunities, and waiting for other things. In fact, life is waiting for us so that we must go for it. Understand and apply this in your daily life and I believe you can succeed,” ended Fahd.